Sara Meredith is a skin care goddess based in Koreatown, Los Angeles. She is half Filipino and half British, born in Hong Kong and lived in India, Turkey, and the UK. She wanted to settle down in a place to call home and was drawn to LA because of it's vibrant Asian American community and the strong sense of belonging. 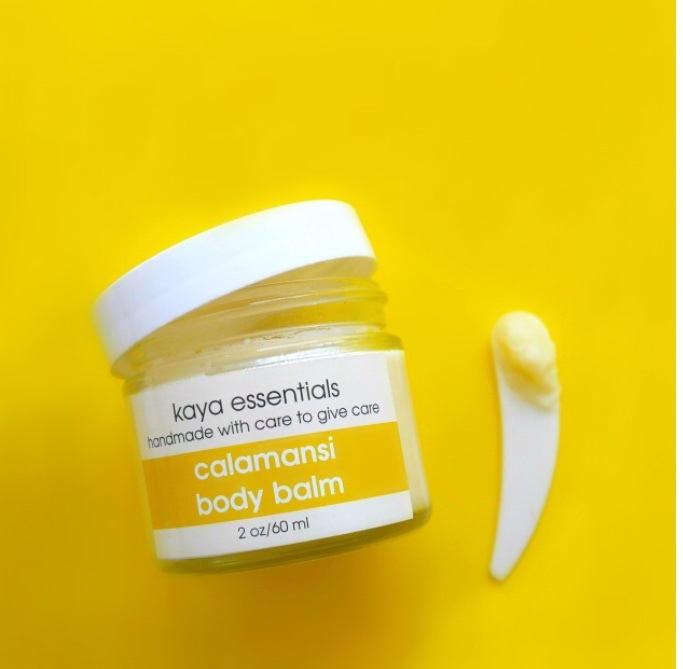 kaya essentials began when Sara and her mother would make coconut hair masks and her research on fair-trade coconut oil, grew into a company, and gives back to the Filipino community through meals for Filipino school children. It's a beautiful company with a beautiful purpose. When I was in college, I interned for a Filipino NGO called Gawad Kalinga, which translates to give care in Tagalog. I was a research assistant for their office in Europe and in the summers would volunteer at their farm in the Philippines. I learned what a social business was and saw how you could align your passion with your mission. I saw how much fertile land the Philippines had and their commitment to have Filipino farmers part of that growth, expanding beyond rice crop and diversifying so a farmer family could break the cycle of poverty. Their feeding program, Kusina ng Kalinga, which translates to Kitchen of Care also captured my heart. It's a grassroots feeding program that cook lunch meals in public schools for children aged between 5-11 years old. The GK volunteers are there from 5 am every morning to have 200-400 lunch meals prepared for the school day. Mothers of the local community said how nice it was to not have to cook lunch, it saved them time and money. I didn't know what career I would go into and everyone kept saying "follow your passion," but it was so unclear to me what that was. Finally, I saw that I could align my passion for the Philippines with my social business. How did you chose the name, Kaya Essentials? "Kaya" in Tagalog means can-do and it represents the idea that when we kaya together, we have a greater impact. In every sense, when a community comes together, amazing changes and new understandings of societies arise. For me, I saw that there was more than enough money in the world to make a difference, enough food is being produced in the world to feed everyone, what we really need is a system of communities to make a difference. Personally, it's also an affirmation for myself when it gets hard as an entrepreneur and amongst this girl boss world, I strive for less competition and judgement amongst us women and to work together! What inspired you to use organic Filipino coconut and Filipino ingredients like calamansi? The Philippines has been a world provider of organic virgin coconut oil for centuries, the technology in processing coconut oil in the Philippines provides high grade coconut oil for your skin. However, there is little recognition for this even amongst us Filipinos. My mom and I always used coconut oil as a hair mask together, and I was tired of buying jars of coconut oil that had in small letters in the back "sourced from the Philippines." I also learned that 60% of coconut farmers live below the poverty line, so we source from a fairtrade farm in the Philippines. Our signature aroma, calamansi, was a beautiful-eerie moment when I found it. It's our way to share a part of our culture and we source it from a family business in the Philippines. You have a lot of tagalog sayings/phrases incorporated in your business, what is the inspiration behind that? We have postcards with tagalog phrases and affirmations, it's a way to share our culture and to inspire Filipinos and celebrate the beauty of our language. We found the most popular phrase was our "mahal kita," (I love you) card. When we see younger Filipinos get excited by these cards, they want to put them on their notebooks, give them to their best friends - it means everything to us! What was your driving force to give back to the Philippines? And how did you choose that charity? When I volunteered for Gawad Kalinga, a grassroots charity that strives to change communities from a holistic approach - it was the first time that I saw a movement that could alleviate poverty on a large, life-changing and consistent scale. It's funny, for me it wasn't the classes I took in college that guided me to my career, but this summer internship that turned into a life-long advocacy of making an impact in the Philippines. What do you love about the work you do? What/Who is your biggest passion? I love the passion I have for kaya essentials, it's so deep in my soul and is something that I own that cannot be swayed with what is on trend or what business guru's say. The external factors of building a business is challenging for me. I don't have a business background, and there are certain areas that I can learn easily, and some are much harder than others. But that passion is the biggest support system for me as a female entrepreneur in all of this! I didn't anticipate how lonely it would be to work as a one woman social business. When I've found various groups of female founders it really is comforting and inspiring. My creative juices get flowing, it encourages me to reflect on where kaya essentials is and where I am personally so I can re-energize. Do you have any upcoming projects, events, new product that you are excited about? Yes! We will be launching coconut clay masks infused with different herbs to cater for every skin type!